Much like their historical competitor, the J. R. Watkins Medical Co., the W. T. Rawleigh Company of Freeport, IL, used direct sales through a fleet of door to door salesmen to build their business. The Rawleigh Company advertised their scientific practices to deliver quality ingredients to their customers. Though smaller now than it its heyday, the Rawleigh Company is still around, selling their products to their loyal customers. Three years later he was successful enough to start advertising. With Mrs. Rawleigh’s help, cooperation and support, he began to make his own products in their home. Soon after that, he mortgaged his home, borrowed money from all available sources and started his first small factory and laboratory in a rented building downtown. Six year later in 1898 he built his first factory building, located on Douglas Avenue in the residence district of Freeport. In a laboratory in that building, Mr. J.R. Jackson, his brother-in-law, under Rawleigh’s supervision, made careful tests and established new standards of strength and uniformity. In 1924, Rawleigh began curing vanilla in Mexico and the West Indies, and in the same year opened a branch in Marseille, France and bought plantations in Madagascar and its dependencies, opened a vanilla office in Tamatave and began to cultivate, cure and buy vanilla. He did this because at that time the vanilla industry was highly inflated, closely controlled and manipulated and prices were about double what they should have been. When Rawleigh had accumulated abundant stocks of vanilla he proceeded to fight the monopoly that was strangling the islands and which monopolized the vanilla market at an artificial price of $9.50 a pound, F.O.B. New York, the highest price ever known up to that time. He first printed a series of vanilla market reports calling attention to the fact that there was no real shortage of vanilla supplies, that crops were above normal and abundant stocks were in the hands of dealers and speculators. He further pointed out the fact that despite these conditions the artificial price of $9.50 prevailed. Rawleigh was so successful in his fight against this monopolistic practice that during the first year of his fight, he successfully reduced the price of vanilla from the artificial high of $9.50 a pound to $2.50-$3.00 a pound. Foreign branches were started in 1925 at St. Mary’s Island, Reunion Island, Mexico, Grand Comore Island to secure raw materials at lower prices. On Zanzibar and Pemba Islands large staffs of employees were buying, cleaning, packing and shipping Rawleigh quality cloves. In Japan and elsewhere in the Far East, Rawleigh employees were busy making studies, investigating crops and markets for menthol, camphor, peppermint, cassia, black pepper, nutmegs and other raw materials. In line with Rawleigh’s unflagging efforts to pioneer and discover new markets and supplies, as well as to modernize and update his factory operations, Rawleigh’s glass bottle factory was built at Freeport in 1926 to make the carload of bottles that was being used every working day at the Rawleigh factories. The glass furnace tank held 150 tons of molten glass (about 2600 degrees F.) which was heated by blasts of producer gas. Three forming machines supplied automatic feeders with a capacity of 60 bottles per minute. Rawleigh was a forerunner of the “direct-to-customer” method, meaning you bought their products by mail or from door-to-door salesmen. Then as now, you won’t find Rawleigh products in any store. Their method certainly worked; by 1920 Rawleigh had more than 22 million customers.The company built sprawling manufacturing plants in several cities across America. The 110,000-square-foot facility at 139 Illinois [in Memphis] opened in 1912 and was the largest Rawleigh plant in the country, making patent medicines, cosmetics, insecticides, and spices. In 1958, the big manufacturing operation here shut down. The buildings were converted into warehouses for the company. Rawleigh finally closed its Memphis division completely in the late 1970s, and the complex — which is actually three adjoining buildings — was sold. In recent years it has been used as a production and distribution facility for John Simmons’ gift and art company, Carnevale, among other things. The W.T. Rawleigh Company is still around, and has adapted to the changing times by setting up a handy website where customers can purchase their products online. Rawleigh salesman with horse-drawn wagon. It sold medical supplies, flavored extracts and ground spices. The motto was “You don’t pay until you are satisfied”. This is wagon #534, belonged to the W.T. Rawleigh Medical Co., Freeport, IL. Postcard made November 12, 1909 by photographer Resier on an AZO back. 1917 edition of the Rawleigh’s Almanac, Cook Book and Medical Guide. Front. 1917 edition of the Rawleigh’s Almanac, Cook Book and Medical Guide. Back. Postcard with Bird’s Eye View of Main Laboratories, The W.T. Rawleigh Company. Recently we purchased an old home, built in 1883. We found many old bottles, one is a Raleigh’s clear bottle simular to the first picture listed on this site. There are no visible markings, except for the name on the front. I would love to know the history! Our kids find these bottles facinating! Hi Christy, thanks for reading. I don’t have any further details about the manufacture of the bottle itself. Without other markings, further details may be difficult to track down. There may be resources available on bottle collector forums that could provide you more details. Christy, Great find. You can really teach your kids some good history with these things. So just a few helpful hints. As far as the tins of spices, salve, etc, look at the back for the company’s address. The US government didn’t start using the zip code system until the early sixties. So if it doesn’t have a zip code with the address, you know that it is prior to the early 60’s. With respect to the glass bottles, this company went to a screw on cap in the early 1920’s. So generally if it is a cork type bottle then it is going to be pre-1920. After that you have to look at how the glass was made to date the bottles, but I don’t remember the specifics of how you do that. Hope that helps. quite interested in knowing if Rawleighs has official website. thank you. A google search suggests http://www.wtrawleigh.com/ is the current website. My Dad, William Lutz, was a Rawleigh’s door to door salesman in Southwestern Ontario based in the Waterloo area sometime in the late 1920’s and 1930’s. I wonder if there are any records which would tell me what years he worked for Rawleighs. It was before I was born. Hi, I’m afraid I don’t have any records from the company beyond what’s currently available to the public online. You can try to get in touch with someone in the company at their website http://www.wtrawleigh.com/. I have an old Rawleighs clear bottle. It only says Rawleighs Trademark and is similar to the one at the top of the page. Except this one appears to have a metal lid and is still full of whatever brown product was originally in it. Any history on this one? I can’t tell you any more about the bottle. I don’t know where they were blown or from where they were distributed, or what was in each bottle type, I don’t have any of those records. But I can tell you this much with total confidence: Don’t ingest the contents of that bottle! 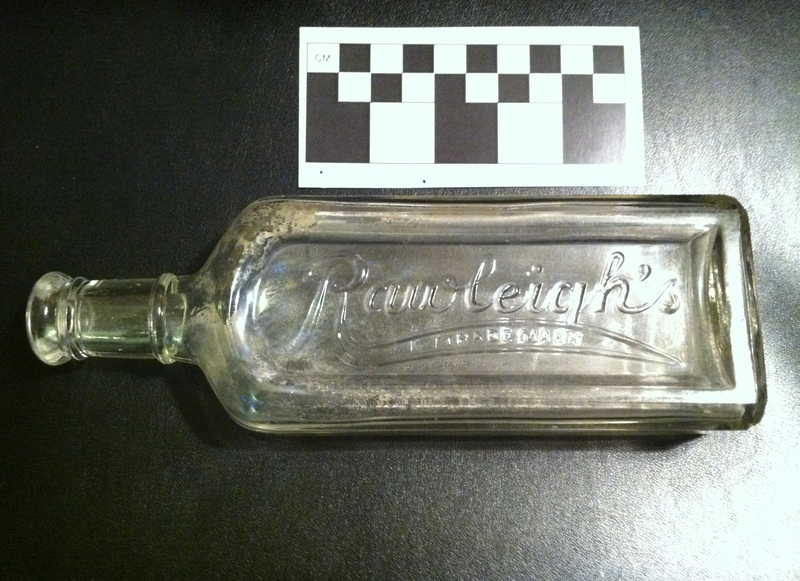 The Rawleigh Company used a cork type bottle until the early 19020’s. In the early 20’s they switched to the screw on lid. If it has a label still on the bottle then look at the back for the company address. The US government did not start using the zip code system until the early 60’s so if it doesn’t have a zip code in the address then that will also help you narrow the date. MY FATHER, FILLMER HEVENER, SR., SOLD RAWLEIGH PRODUCTS IN VIRGINIA AND WEST VIRGINIA DURING THE 1940’S-60’S. MANY CUSTOMERS WERE DEVOTED TO THE LINE OF PRODUCTS, ESPECIALLY THE GARDEN DUST. A NUMBER OF TIMES I VISITED THE RAWLEIGH OFFICES AND SHIPPING BUILDING IN RICHMOND, VA. THE SALES MANAGER WAS A MR. DRIGGERS. MY MOTHER, ESTIE HEVENER, USED THE PRODUCTS FAITHFULLY IN HER KITCHEN AND GARDEN. IF YOU WISH TO CONTACT ME, MY EMAIL IS FHEVENER@OILART. COM. I FOUNDED AND PASTOR GUTHRIE MEMORIAL CHAPEL, FARMVILLE, VA. http://WWW.GUTHRIEMEMORIAL.ORG. THE RAWLEIGH COMPANY WAS A BLESSING TO OUR FAMILY. WE THANK GOD FOR SUCH INDIVIDUALS AS W.T. RAWLEIGH. DR. FILLMER HEVENER, JR.
W. T. Rawleigh was my mother’s uncle. I met him once at his estate as an awe-struck pre-teen in the late 40’s. He was a great man who played a large role in the lives of his family and others in his sphere of influence, which extends to this day! I found a “Sample of Mexican Vanilla Bean” in a 8″ glass tube inside it’s original yellow box that slides open, from the WT Raleigh Co. It says on box “Represents the largest lot of Vanilla Beans ever purchased in the world” it is a free sample of a whole vanilla bean, additional bean in tube was available for 20 cents by mail. Can you please give me a date for this? The company has just gone through a change and is back to its original foundations using the W.T. Rawleigh name. You may contact me if you so choose. I have been a “distributor”(this is an obsolete title at this time) since 1989. My name is Darci Douglass. My e-mail address is JesusInMe4Ever@sbcglobal.net. Stilling looking for the coconut cream pie filling packet, got one from friend in Prairie Du Sac WI, back in 1976. is this the Rawleigh Co? Hello I have found in Australia a Rawleigh’s Clear Glass Bottle which is in mint condition and on the bottom it is marked with ‘J631’ with a capital ‘M’ underneath, the next marking is a ‘G’ on top of an ‘M’ shaped into two squares. I was just wondering whether this bottle was made for nineteen twenty six and what it was worth, thank you. Hi, thanks for reading. I’m afraid I don’t have any info about the dates for bottle marks for this company. You can look up bottle manufacturing styles (automatic vs semi automatic) and check for seams around the embossed label, or check whether the top looks like it was machine made or hand finished, but that will only give you a rough idea since different companies used different methods over time. Good luck! I just got back from a walk in the woods here at home and while I was puttering around in the woods I found a W T Rawleigh bottle Freeport Ill. on the side. The right leg of the r in Rawleigh is a straight line instead of curved like some I found a photo of. Looks like this one used a cork stopper to seal it. Anyone want to buy it. I could use a couple million bucks. You’re liable to find old tonic & liniment bottles tucked-away in some odd places, including the woods. During Prohibition much of it was kept hidden from children/spouses for one’s own consumption, as some contained very high percentages of alcohol. Archaeologists seem to find them everywhere…. The Freeport plant had a huge steam boiler operation to power and heat the Freeport plant. WT Rawleigh contacted business and store owners around his plant and sold them piped in steam for heat and other uses. Old WT would not let any chance to make a buck go untouched. He was given a Ford Model A by Henry Ford and he drove it to work every day and announced to all that the Model A was the most reliable car ever built and his Model A never had problems. What he did not know was his staff borrowed the car at night and took it to the local Ford garage to be surviced and had it back in WT’s garage before he work up. WT Rawleigh’s ability to create an internationally recognized successful business was followed up by his inability to hire qualified managers to carry on his legacy. WT believed only he could run the company and the failure to hire qualified managers was the main reason for the failure of the WT Rawleigh companies and the loss of jobs for thousaneds of loyal employees. The WT Rawleigh plant in Freeport still stands as a silent reminder of an era gone by and a man who created an empire and lost it. I have a bottle of SACHET POWDER it is half full of the powder. It has a label manufactured in Freeport Illinois U.S.A. no area code. Net Wt. ! 1/2 OZ screw on cap. It has 4 or 5 markings on the bottom not sure what they are. Can anyone help me with this? what it might be worth.